A study table helps a kid stay organized, which is important for their life. It keeps their work sorted, arranged and neat. Using a study table for essential works such as school homework and projects is a very healthy habit. Given below is a list of the top best study table designs for kids. Browse through and make a pick. 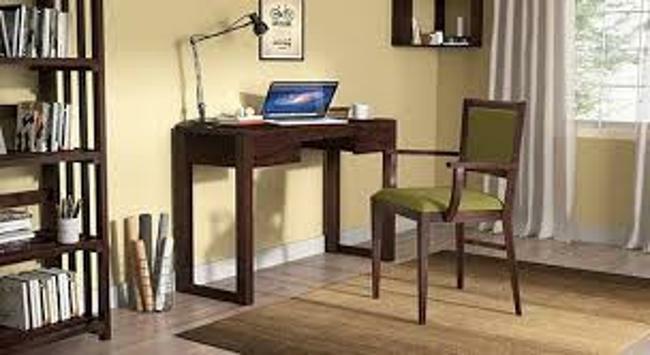 It is an essential study table for people who want a dedicated and strict workplace. MDF and PVC are used to build the body with metal in powder coating legs and a tempered glass top. There are two small shelves above the storage and one below the glass top. This deep walnut polish corner study table is designed to make the most of your space and fits perfectly at a corner. Made with engineered wood, rubberwood and veneer legs, it has a shelf below to store papers and files. The walnut polish gives a contemporary look in the design. This table has space for everything you need in your workstation. Made of engineered wood the matte white finish will complement any decor fashion. The table top can be folded down and converted into a display or storage unit. A sturdy table with two drawers and slim proportions. The slim design can fit perfectly at a corner. With its ample storage space and wide table top, it is best suited as a study table for students. Made with MDF top and a metal base, it is a functional, sleek and elegant study table with a surprising variety of storage space available. One can store all the work essentials like pen, pencils, staplers and other souvenirs. There is a little pocket by the side for all of them with a small shutter. It has a proper wire arrangement system to keep speakers or laptop wires out of sight. Built with MDF and powder-coated metal (wenge finish), it has laddered shelves for books and CDs and stuff. The spacious tabletop shelves books, laptops, printer, stationery and more. The design makes the study table look organized and arranged. It is one of the best student study tables one can come across and is coolly contemporary. While looking for a study table for kids, online shopping is the best answer. There are many customizable options available for each study table, and you can choose a selective color combination in harmony with the theme of the kid’s room. The storage spaces available in most study tables can be used in a variety of ways by a kid. He can store his roller-skates, favorite books, power-ranger Legos, etc. Another factor to keep in mind while buying a study table for your kid is the kid’s age and height. He should be comfortable while using the table and its chair. While choosing the perfect study table for your home, you can also check out the bunk beds for kids.